Perfect for envelopes, file folders and many other labeling tasks. 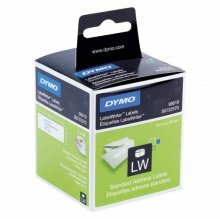 Dymo Labelwriter Labels use a thermal labeller transfer printing process so you never need to bother with messy, expensive ink or toner cartridges. And because they're packaged in continuous rolls, you can print one address label or hundreds with ease with no sheet label jams, no layout hassles and no waste.